PowerSchool Apps are available for free for Apple and Android users. The PowerSchool Parent Portal gives parents and students access to real-time information including attendance, grades and detailed assignment descriptions, school bulletins and even personal messages from a teacher. PowerSchool’s Parent Portal provides single sign-on access. With single sign-on access, parents create and maintain their account using the appropriate access credentials. Once parents have created their account, they will be able to manage their account information, link any and all students to their account (for whom they have parental or legal rights), and set email and notifications preferences for each student linked to the account. If account sign-in information has been forgotten, it can be retrieved by using the “auto-recovery” feature on the sign-in page. You can even deposit money into lunch accounts. Use the following procedure to create a new parent account. In order to create an account, you must have the Access ID and Password for at least one student enrolled. 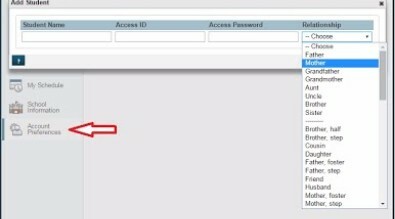 When creating the account, you will need the Access ID and Password for each student that you would like associated with your parent account. If you do not have this information or have questions, please contact the school. Enter the student’s First Name, Last Name, (contact school office) School Web Access ID & Web Access Password Office Staff) and your relationship to him/her for each student. Note: The first name is the full name as indicated on their school enrollment form.Repeat Step 4 to add additional students to your account, if you have more than one student being added. You can also use PowerSchool to register to receive email alerts for grades, attendance, assignments and more. 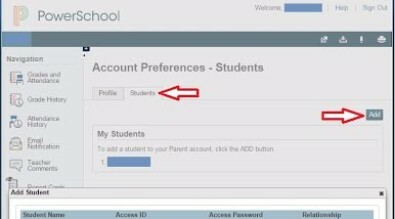 If you already have a PowerSchool login set up, but wish to add a student, you just need to log on and click the Account Preferences button. It will take you to your profile where you need to click the Students Tab and then click the Add button (Fig. 2). Enter the student Access ID and Access Password information provided from the main office. Dial 262-348-2180 for assistance. SchoolPay E-payments - a convenient way to pay school fees and deposit lunch money with credit card or check on line.